Foiling is a new frontier. Development is rapid in a number of countries, ranging from the America's Cup to home grown amateur projects. It promises to become a new branch of sailing, and the club would like to be in the forefront. Brightlingsea Sailing Club has a long history of welcoming innovation, dating back to the days of Reg White, Lady Helmsman and the Little America's Cup. Foiling occurs on a sailboat when a wing section under the water is used to lift the boat clear of the water. Dramatically increased speeds can be achieved when there is no hull in the water due to lower drag and an increase in apparent wind. The world goes silent as you fly. There's nothing new in the basic foiling theory, which goes back to the 1920s. Commercial power driven hydrofoils were developed after WW2 and their usage peaked in the 1970s and 1980s. Speed sailors have been experimenting with foils for many years, with organized "speed weeks" at Brest in Britanny and Weymouth in the UK. 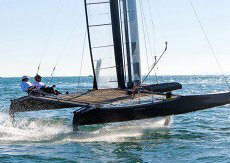 Best known is "Icarus", a foiling Tornado developed by James Grogono and a small syndicate of amateurs. In recent years several catamaran classes have started to use curved dagger boards which lift the boats partly out of the water. This can be described as "skimming" or "semi-foiling. But the curved daggerboards, or C foils, are unsuitable for full foiling as there is little lateral resistance when the boat comes too far out of the water. 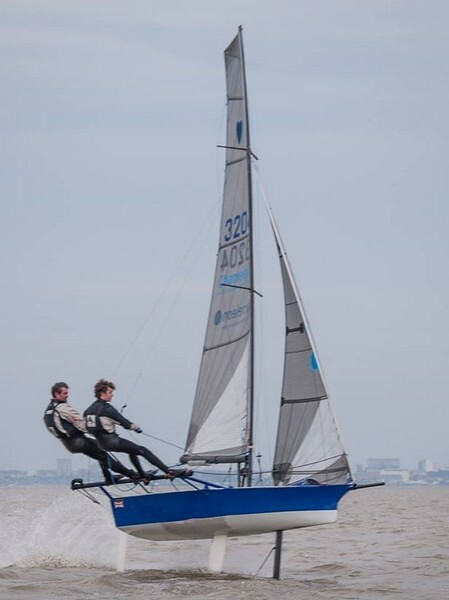 The best known example of a skimming catamaran is the Nacra 17, now adopted as an Olympic class for 2016 and 2020, and sailed by a number of younger Brightlingsea sailors, including Rupert White, Nicky Boniface and Maddy and Finbar Anderson. Why the new interest in foiling? The recent wave of development was led by the International Moth Class, which started developing competitive foilers in 2001 (read more history here). Now they are foiling in as little as 6-7 knots of wind and achieving maximum speeds of over 30 knots. Foiling moths are much faster in all but very light winds. This is now recognized in their PY number which has fallen to 600, the fastest listed for any mono or multihull. The class has enjoyed huge international growth since it started foiling, and its World Championships is now one of the most prestigious events in the sailing world. A further dramatic boost was provided by the 2013 America's Cup. Images of huge wing sailed 72 foot catmarans foiling at 40 knots plus on San Francisco harbor were broadcast all over the world. Improvements were visible during the event, especially to consistency of foiling upwind. 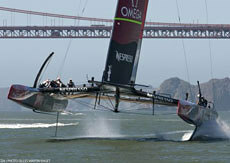 Watch a video describing the America's cup foils here. 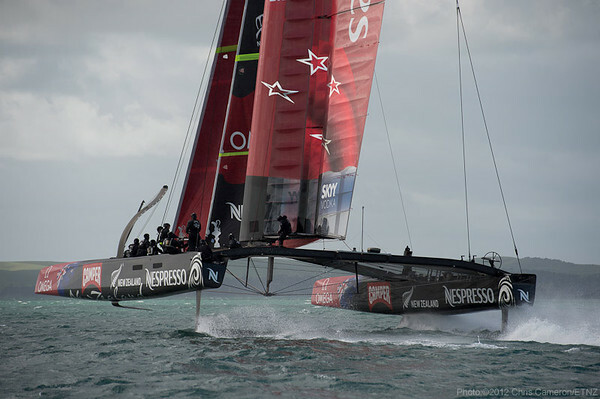 Now (April 2014) several catamarans are adopting the L foil technology developed originally by the New Zealand America's cup team, and later improved by the winning Oracle team. The foils can be raked forward to increase lift, and inwards to form V foils which are self regulating. But in V formation the foils are less able to resist leeway. The C class has followed broadly the same line of development as the America's cup boats. The leaders in Falmouth 2013 were Groupama and Hydros, both with AC72 foils. The winner, Groupama, appeared to have more control due to a more accentuated V shape to its main foils, but there were many other factors at work. The leading A class sailors were foiling consistently downwind at their January 2014 World Championship in Takapuna, New Zealand. Development for this class has been constrained by class rules that require foils to be inserted through the deck. As a result the sailors have developed J foils with vertical tips to reduce in flight leeway – all optimized so they can just be inserted from the top. The Flying Phantoms are now being sold commercially with technology drawn directly from the Groupama C class campaign. The first boats are due to be delivered later in 2014. A Flying Nacra 20 Carbon is now available commercially, with technology from Melvin and Morelli, a design firm heavily involved in the America's cup. There are many other projects on the go. For example Luke Yeates and Jack Gifford from Weston SC are working hard on Cobalt, a foiler designed to break the Round the Isle of Wight record. In July 2014 there will be a foiling week on Lake Garda and all sorts of developments will be visible. How can you go foiling? The first step might be to visit the Pro-Vela sailing centre on the Mar Menor, an Inland Sea on the Spanish East Coast. Run by Alan Hillman (who has connections with Brightlingsea) they will hire you a foiling moth and show you the ropes. A few days there will put you on the road. Secondly you might want to get involved in one of the foiling projects already under way at BSC – see below. Help is needed on rigging, repairing, rib driving, measuring performance and analyzing data. Volunteers welcome. We also need a group of people with a positive attitude to experimentation. Things will go wrong, and those who have spent time and money may get downhearted – please encourage and support where you can. Finally you might want to buy your own foiler or start your own development programme. We already have three Moths and two experimental full foiling programmes. We have no organized racing for foilers, and the moths have yet to seriously participate in club racing. But long distance events such as the East Coast Piers Race are welcoming fast monohulls and some moths will be entering. For now the fun of flying is too much. No-one worries about class racing while the challenge of controlled flight is there to be mastered. Graham and Eddie Bridle have been experimenting with foils on their Cherub. The Cherub has always been an influential experimental development class, with many respected sailors involved over the years, including the Bethwaite family and Iain Murray of Americas Cup fame. Since 2005 Cherubs have been using T-Foils on the rudder only. This allows the crew weight to be moved further aft pushing the load through the rudder blade onto the foil. 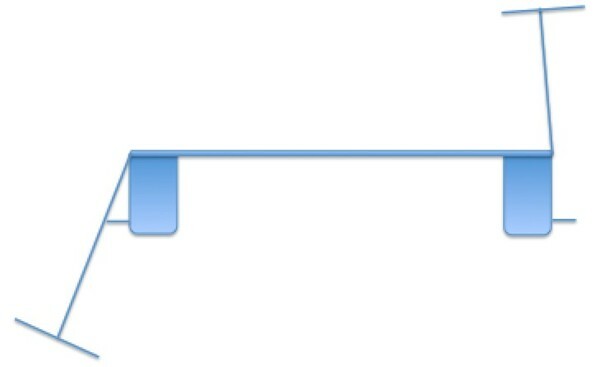 This means less weight on the hull, and therefore less displacement and drag. In this mode Graham and Eddie won the National Championships twice. In 2013 with build help from Graham Eeles, Graham took this one stage further adding a front foil through a small slot midway between the mast and the bow. This was a phase one attempt to fully foil the boat without major modification. Initially, Graham tried this system using only the ability to trim the rudder foil to achieve stability. While this proved that foiling the two-man boat was possible, a better control mechanism was going to be needed, as foiling stints usually ended in a big crash! The next version saw an aileron flap on the rear of the front foil and a wand affixed to the bow, in much the same way as the Moths do. All that was required now was to link the wand to the aileron – not as easy as it sounds as the Cherub has asymmetric spinnaker poles in the way, as well as a spinnaker sock and other controls. To solve this the two Grahams devised a hydraulic system to transfer the motion of the wand to the aileron. While this worked in principle there were too many issues with leaking fluid so a new system was needed. The preferred solution to remove all of the boat based linkage, was to use a foil mounted trailing wand. This simple solution is easy to fit and offers sufficient flight stability for sustained periods. Upwind speeds are now regularly in excess of 20 knots and control is possible. The latest addition (following the talk from Paul Larsen!) is to add a "fence" to the rudder about 120mm above the foil. This stops air travelling don the rudder blade to the foil, causing it to cavitate and become useless. The fence is a very effective and necessary addition. This level of success means that this Cherub is the only (and possibly the first) two-man, twin trapeze, fully foiling boat in the UK. Indeed the only other class doing this is the R-Class in New Zealand. Grahams development has sparked much debate on the Cherub class about whether it wishes to adopt foiling as a development thread in the coming years. William Sunnucks first joined BSC in 1978 with a Laser. He continued with catamaran sailing after Olympic Tornado campaigns in 1992 and 1996 and won a series of long distance events and national championships in the Hurricane, Tornado and F18 classes. In 2009 he launched the Vampire, an experimental catamaran which uses standard Marstrom 20 hulls, but almost everything else has been changed: it has longer beams and a completely different rig. The Vampire has already won line honours in all the major long distance races on the Northern European circuit, including Round Texel, Raid de Houat, East Coast Piers, Kent Forts and the Solent Forts race. In 2013 the Vampire sprouted curved dagger boards and large rudder foils. The dagger boards generated lift, and at times lifted the boat clear of the water: but flying with these boards was slow because there was no leeway resistance in flight. The rudder foils were quickly cut down when it was found that too much lift was generated and the boat was sailing in a nose down posture. It was clear that the next set of foils needed proper design calculations before they were built: guessing was too expensive. During 2014 the Vampire will became a full foiler. The aim is to produce a practical foiling solution which is significantly faster, more practical and accessible to a wider range of sailors. The concept was developed by fluid dynamicist Kevin Ellway, designer of the Exocet International Moth, the first to be designed completely using mathematical models. Scores of virtual moth designs were "flown" before putting the final design into production, and the same general approach has been taken with the Vampire project. He is now working on rig developments to get the best out of the platform. The foils have been built in Brightlingsea Essex by Graham Eeles a specialist boat builder engaged in a number of innovative projects. He has converted the desktop theory into strong and practical foils and has been coaching for the early test outings. 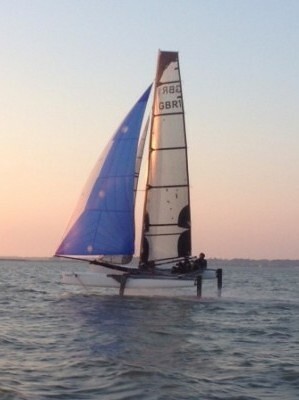 The new catamaran foil design is showing early and exciting promise. 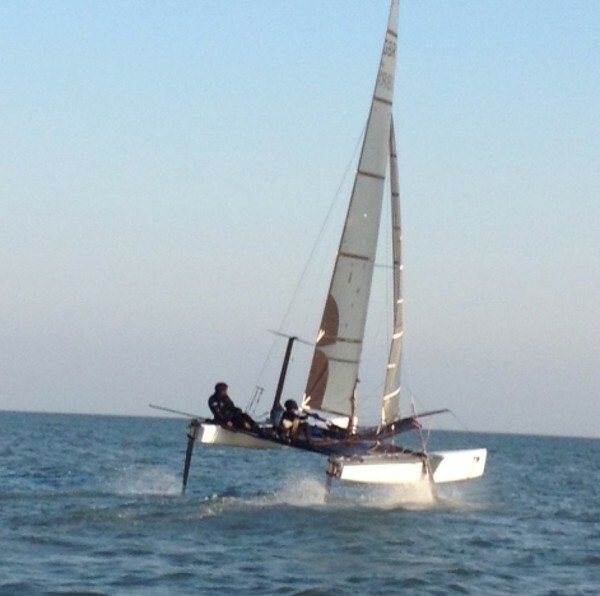 It is currently being trialled on the 20 foot Vampire and will make its race debut in the Vattenfall Whitstable Forts Race on 13/14 September 2014. Downwind speeds are consistently over 20 knots peaking at around 26 knots. When the development work is complete the technology should be transferable to other catamaran platforms such as the Tornado, F16 and F18. 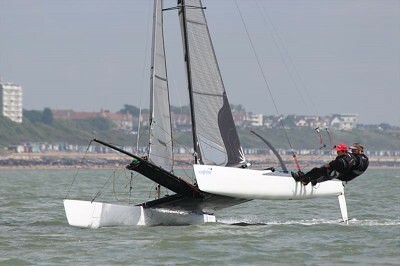 This is the first catamaran to be fitted with canted T foils. The 20 degree outwards cant is designed to give least drag, imitating the windward heel of a moth sailing upwind. There is no need to insert the foils from the bottom of the boat, allowing it to be easily assembled and launched from a beach. Light wind performance is enhanced by withdrawing the foils completely and using conventional daggerboards. The Vampire, originally an M20 from Marstrom Composites in Sweden, is 20 foot long and 12 foot wide sporting a 27sqm rig, and a further 27sqm spinnaker. William would like to see Brightlingsea as a centre where monohull and catamaran sailors can work together on new ideas.